Butterflies are Venetian Glass Mosaics; Golden spider in the field; and Crema Valencia on the borders. On April 28, 2006, Wynn Las Vegas celebrated its one-year anniversary by breaking ground on a second hotel tower. Initially named the Encore Suites at Wynn Las Vegas, the 2,034-room hotel was originally envisioned as an expansion of Wynn Las Vegas. 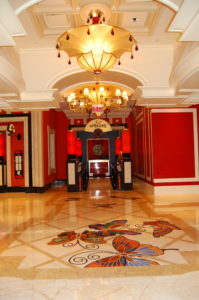 Steve Wynn, Owner, and Roger Thomas, Designer, wanted to carry some of the unique design elements from the Wynn Casino + Hotel to the Encore project, but make it more contemporary. 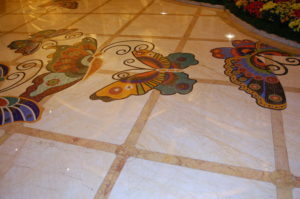 They decided to use the same marble for the common areas (lobby, casino, and corridors). As the $2.3 billion project expanded into a full-scale hotel and casino, it was soon realized that far more stone would need to be procured than initially envisioned. Golden Spider in the field; Crema Valencia at the border; and, Mongolian Brown Onyx on the perimeter. The quantity of Golden Spider needed to supply the project was immense. Steve says, “If we waited to purchase the blocks once construction began, there would not be enough product to finish the project.” Quarrying and processing this much stone requires a lot of project management if one intends to meet the construction schedule. We convinced the Wynn Team that the blocks needed to be accumulated a year ahead of the construction start to insure they would have enough material to finish the project on time and on budget. They agreed and gave us the order for the blocks. We immediately put our Italian inspector on the job to oversee the quarry operation and selection of material from the Golden Spider quarry in Greece. The material was supplied on time and within Wynn’s approved color selection. Stone Ally supplied all of the stone and marble for the Wynn Casino + Hotel, Vegas and the Golden Spider was the main stone used for all the common public areas. He went on to supply stone for the Wynn Hotel + Casino, Macau, China. 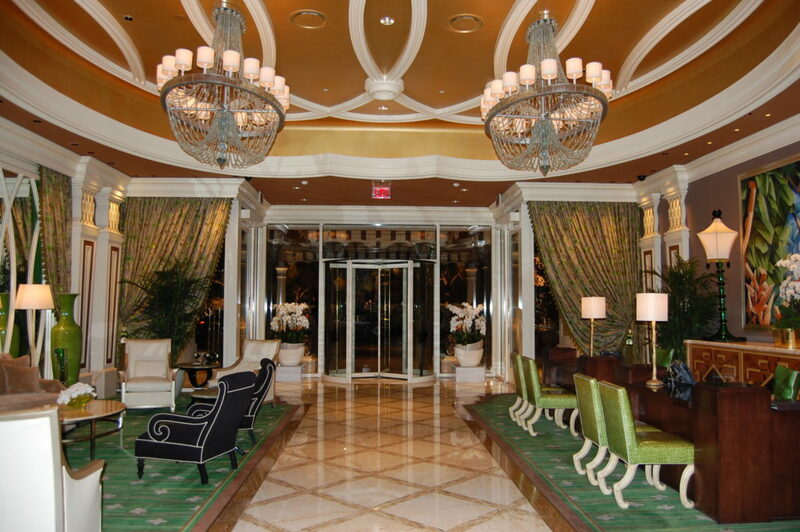 Stone Ally is proud of our work on the Encore Casino + Hotel-Las Vegas. Enjoy the Encore photo gallery.